Everything was done with Photoshop : the wood, the creased paper, the adhesif, the burned stuffs in the wood too...etc...I didn't use stock images. There're...euh...a lot of layers and the pic of Sakura and Syaoran was scanned by me from a pencilboard of mine ^_^ The original picture is, of course, in color, but I needed it to look that way in the wall so I changed it quite a lot. You can see that the sketch on paper is not in a good state, it's -of course- done on purpose, and the blurry parts too. This wall is not really my style but well, I just wanted to try to make complicated stuff and not hear again "it's so simple!" at least once in my lifetime :P But I don't think I'm going to make something like that again. MEme si je connais pas cet anime/manga, je trouve le wall assez joli. L'idée de mettre une tite image comme une photo accroché a quelque chose, c'est assez original. J'aime pas trop l'écriture sur la photo par contre. Hei !!! It is too nice !!! A beautiful picture in a amazing background !!! I like it so much. XD keep it coming CuteSherry! whoa!!! This is really cool!! Very unique concept. The wood looks excellent, and I love that picture of them. Looks hand drawn. ^_^ Nice job CuteSherry! wow i like the lighting and love the background looks like a table wood background awesome.... hehehe :) great job! Whoa...neat! I love the way you made this look; really simple, yet totally awesome! Nice job, CuteSherry. It's nice! ^^ I like how you retouch the scan, it looks like a picture of them ^^ you managed the wood well, it must have been hard!. Although it looks a little empty :x it's very nice though. Good job!! 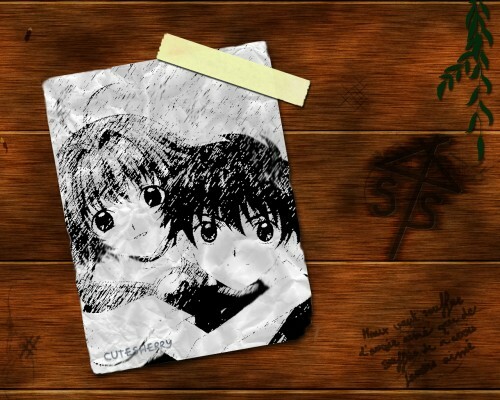 I like Sakura and Syaoran in there..
Their image on a crumpled paper i think.. The wood looks real too.. I just wondering about the burn marks.. I do wish i can do like that too..
i like it!!!! XD kawaii! i love sakura and syaoran!!! XD i like this wallie!!! You've chosen a nice concept for this wall! This picture of S+S is really adorable! The back seems simple.. but the picture is amazing..